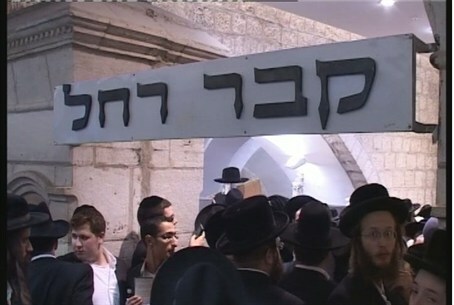 Tens of thousands of people came to visit Rachel’s Tomb. "Rachel is everyone’s mother and we have come to visit our mother." "Mama Ruchel" is the name of a Yiddish song that calls on the Matriarch Rachel to listen to her chidlren's prayers, feel the pain they are suffering and ask G-d to have mercy on them. Rachel is the third of the four mothers of the Jewish people. And there is a Midrashic tale of G-d not listening to Abraham, Moses and other supplicators' requests to forgive the Jewish people. However, when Rachel approaches Him and reminds him of how she gave in and allowed her beloved Jacob to wed her sister Leah, even helping Leah manage to keep Jacob unaware of the deception so she would not be humiliated - although Rachel herself was surely mocked next day by everyone - G-d gives in and relents. That story is but one example of the source of the Jewish people's love for Mother Rachel, Imma Rachel, as she is called affectionately in Hebrew. Rachel's life was full of sorrows that make those with troubles feel that they can relate to her. After all, someone else was under the bride's veil at what should have been her joyous wedding after a seven year wait, she was childless for years and watched her sister give birth to son after son, she finally had a child but died giving birth to her second and did not live to raise her sons. She, however, was buried on the road between Jerusalem and Efrata, so it is at her grave that the Jewish captives wept when forced into the Babylonian exile after the destruction of the first Holy Temple. And from then on, her grave is the site for constant prayers, the place where women, especially, come for comfort when life seems overwhelming. How fitting that the bridal gown of sweet- faced Nava Appelbaum, murdered by terrorists the night before her wedding along with her father while having a cup of coffee and enjoying a fatherly talk on Emek Refaim Street in Jerusalem, has been placed at the side of the tomb. From 1948 to 1967 Jews could not pray there, but they are making up for it. Tens of thousands of people came from all over Israel on Tuesday, the 11th day of the month of Cheshvan, to visit Kever Rachel (Rachel’s Tomb) on her yahrzeit..
Arutz Sheva spoke to the many visitors who came to visit the tomb, and they all said: Rachel is everyone’s mother and we have come to visit our mother. Another worshipper said that Kever Rachel unites all Jews, no matter their origin.